Fry ground beef in a skillet till no longer pink. Add taco seasoning and fry till beef is browned. Cut out 4 inch rounds from tortillas. A pizza cutter makes it easy. Microwave in damp paper towels for 30 seconds (3 at a time) to soften. Mold into muffin tin. 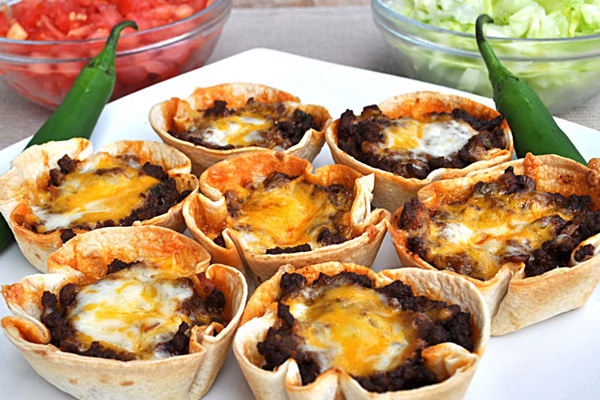 Sprinkle cheese in bottom, add 2 tablespoons (or so) of taco meat, top with more cheese. Bake for 20 mins. Lift out and serve with favorite toppings.